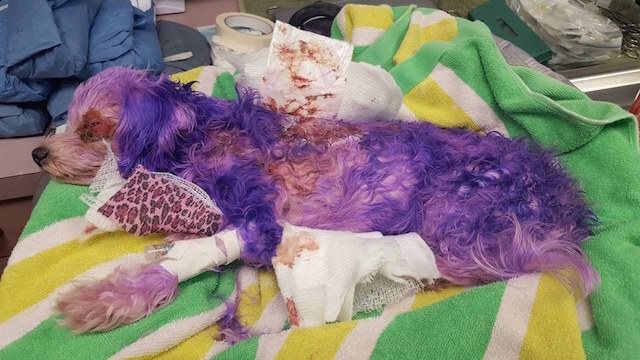 “Grab a tissue and hang on – we promise a very colorful ride – a tale of caution, extreme pain, incredible strength and love.” This is how Pinellas County Animal Services introduces Violet’s story. 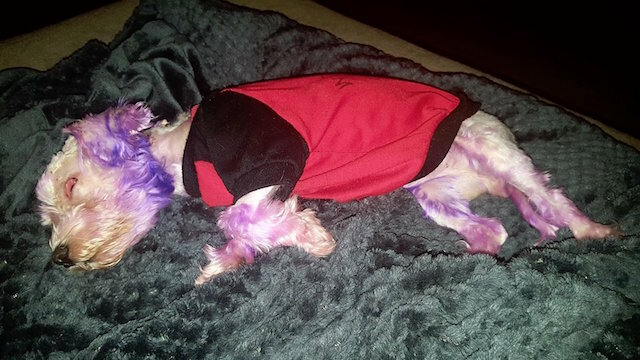 The tiny Maltese mix was dyed purple by her previous owner as part of a grooming makeover, but the person accidentally used human hair dye and ended up burning poor Violet! 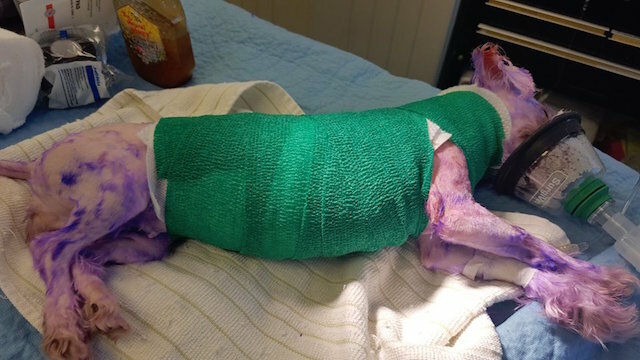 Violet was in very bad shape when she arrived at the shelter. Warning: a few photos below are graphic and may be disturbing to some readers. They were alarmed when they shaved off her fur to really assess the damage that they noticed her “skin began to slough off”. The staff at the shelter wondered if Violet would pull through. 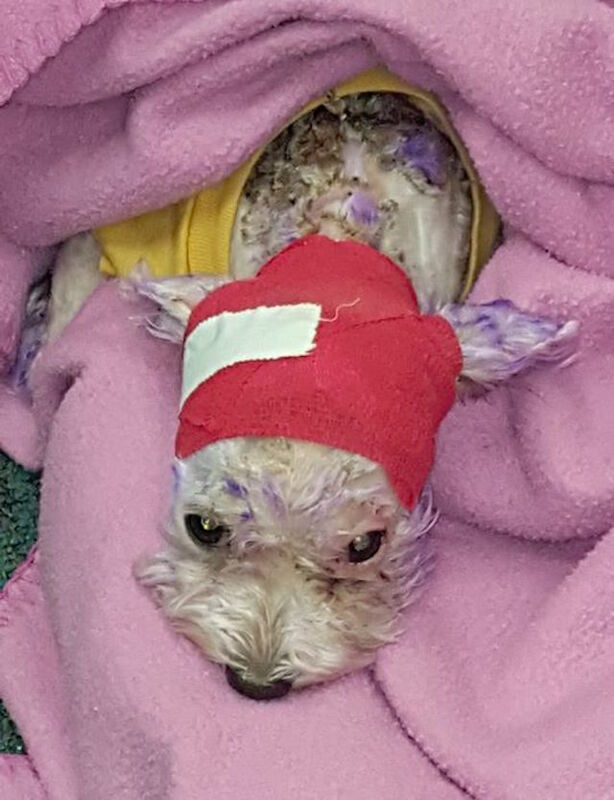 But the 5-pound dog showed a lot of courage and spirit and after three months of intense treatment and tender loving care, Violet is on the mend. “Fast forward 3 months – pain medication, antibiotics, IV fluids, honey treatments, scab removal, anesthetizing, bandage changes, sleepless nights, worrying, hope, worrying, hope and finally the silver lining,” the shelter wrote. Thankfully, there was no lasting effects of the chemicals. Violet can still see and her hair grew back for the most part. “When the final badges came off we breathed a collective sigh of relief – Violet was beautiful,” said her rescuers. She will never look the same as she did before, but her new family doesn’t care. 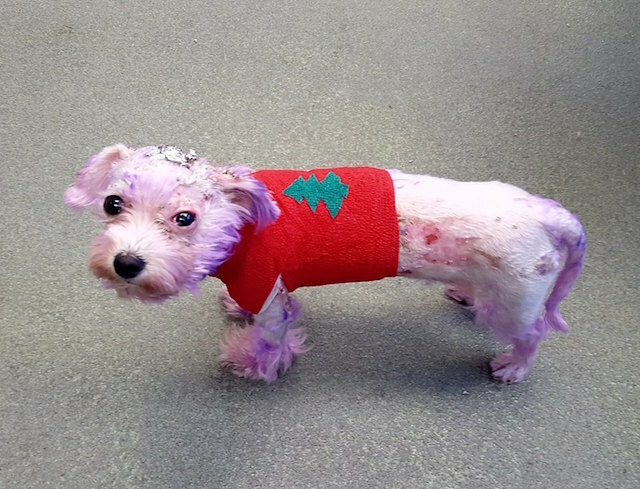 We know that Violet’s new owners will do what they can to raise awareness about the dangers of using human hair products on dogs. 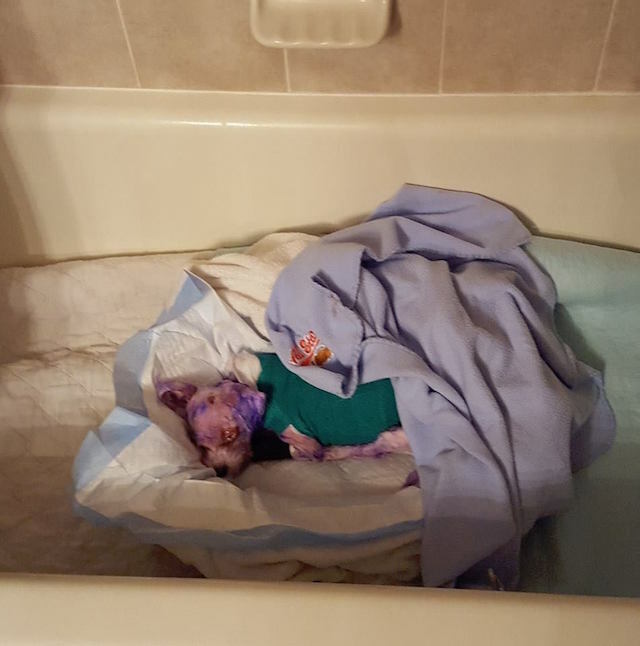 And Pinellas County Animal Services hopes that sharing Violet’s story serves as a caution for all pet parents. There are a variety of pet-friendly hair coloring options available on market including: dyes for pets, pet hair sprays, pet fur chalk and food colorings. If you are considering coloring to your dog’s fur, please consult with a professional groomer and/or veterinarian to discuss safe products and do your research before buying any product. It should also be noted that even if a coloring product is considered pet-friendly, some dogs may have an allergic reaction. To help support Pinellas County Animal Services and see the other dogs they have available for adoption, visit them on Facebook.